Clearbrook Mennonite Brethren Church, ca. 1952. 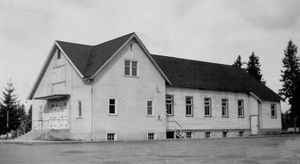 Clearbrook Mennonite Brethren Church, 1957. 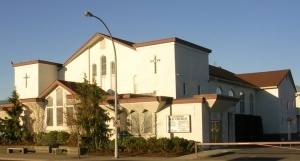 The Clearbrook Mennonite Brethren (MB) Church (originally known as the North Abbotsford Mennonite Brethren Church until June 1950) began as a daughter church of the South Abbotsford Mennonite Brethren Church. A decision to divide into two congregations was made on 27 October 1935. The 27 believers who committed to a new fellowship based their confidence on this promise of Scripture: "Then Moses said: if you don’t go with us personally, don’t let us move a step from this place" (Exodus 33:15). The North Abbotsford group began their services in 1935, originally meeting in the homes of various members. The congregation formally organized on 27 December 1935, with 24 members. Gerhard Rempel was the first leader, elected on 24 January 1936; he served for one year until fellow founder George Doerksen was elected to lead. In December 1936 the church agreed to purchase two acres of land on Clearbrook Road south of the Highway, but most members were not satisfied with the location. In 1940 a plot of land on the corner of Clearbrook Road and Old Yale Road was purchased from the Matsqui Municipality for $1.00. The legal title was registered as Lot Number 161616E on 28 July 1943. To defray the building costs for the sanctuary, the Yarrow Mennonite Brethren Church donated the lumber and cement, while the South Abbotsford MB Church provided the gravel. On 3 November 1940 a 46 foot by 34 foot church was dedicated, costing $700. In 1944 a 20 foot addition to the north end of the church was constructed. The aftermath of World War II forced this church, as many others, to deal with some difficult issues. On 17 December 1946 the Church agreed to make a substantial commitment to support relief efforts for war-torn Europe, resulting in the preservation of 4,000 cans of meat. Moreover, the ravages of the war and migrations required that the Church assist traumatized immigrants find healing and acceptance into Canadian congregational life. The church continued to grow after World War II. 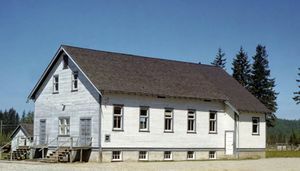 In 1947, 100 members of the church left to form East Aldergrove Mennonite Brethren Church (now Ross Road Community Church). The North Abbotsford congregation gave the new church $6,000 to be used as needed. By 1949 the continued growth in the membership required an addition. With a majority vote of 80%, the congregation decided to enlarge the original building, and an addition was constructed on the south side of the church. 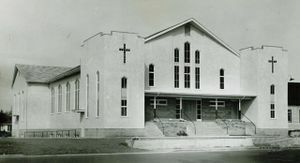 In 1956 construction began on a new sanctuary, south of the existing church and facing Clearbrook Road. On 14 April 1957 the present church was dedicated. Later in 1978 the church foyer was increased and in 1980 an addition to the west end was built that included additional offices and a kitchen and basement expansion. In 1991 the sanctuary and basement were renovated. With the widespread transition from German to English, a short English message was introduced in 1959. Consistent with its goals, the church was deeply engaged in the work of the West Coast Children’s Mission, with Sunday Schools being established at Nicomen Island and Deroche. The latter became Lake Errock MB Church in 1960 (now North Fraser Community Church). In 1962 Rev. Henry H. Janzen (1962-1964) became the first pastor to receive a salary at $300.00 a month, plus housing. The year 1965 marked another significant milestone for the Clearbrook MB Church. With a membership of 625, church facilities were again stretched. The space problem was amiably solved by the launching a new church plant on 2 March 1965. With a generous gift of $15,000, a group of 88 members left to begin the Bakerview Mennonite Brethren Church. Throughout its history, Clearbrook MB Church has supported a number of ministries. From the inception of both the Mennonite Educational Institute and the Mennonite Brethren Bible Institute (now Columbia Bible College) the congregation has been a generous supporter of these two schools. Each year women of this congregation have contributed some 2,000 quilts to Mennonite Central Committee, resulting in an accumulation of more than 35,000 quilts that have been shipped across the globe. During the early 1960s the congregation was involved in starting the Tabor Home and later the Sherwood Senior Citizen’s Home. This is the only church in the Canadian MB Conference that operates a television broadcasting ministry to shut-in people, including transmission to the Tabor Village. During the past several decades, the church has changed with the community around it. Multi-story condominiums for seniors surround the church. As a result, the church has focused on ministries to seniors. Its music and style of worship appeal to the older generation. At the same time, younger families from varying backgrounds preferring a more conservative style of worship have also been attracted to the church. The church offers both German and English language services. With a revitalized vision, this congregation is the spiritual home of 315 members and an average attendance of 185. The 75th anniversary celebrations of this congregation, 7-9 October 2011, emphasized a renewed vision and commitment with which to anticipate the future. In 2015 the church had a membership of 287 and an average weekly attendance of 383. Canadian Mennonite (10 August 1956): 3; (19 April 1957): 1; (26 June 1959): 13; (24 November 1961): 14. McMaster, Barrie. "Grey-Haired Congregation Doesn't Slow Down." Mennonite Brethren Herald (October 2011): 23. Mennonite Brethren Herald (27 May 1988): 23; (22 November 1996): 18-19. Pauls, Helen Rose. "Celebrating Life: The Clearbrook MB Church." Mennonite Brethren Herald (July 2, 2004). Web. 15 March 2009. http://www.mbherald.com/43/09/celebrating.en.html. Rattlzaff, Erich L., ed., A History of the Clearbrook MB Church, 1936-1986. Clearbrook, B.C., 1986: 112 pp. Giesbrecht, David. "Clearbrook Mennonite Brethren Church (Abbotsford, British Columbia, Canada)." Global Anabaptist Mennonite Encyclopedia Online. December 2011. Web. 22 Apr 2019. http://gameo.org/index.php?title=Clearbrook_Mennonite_Brethren_Church_(Abbotsford,_British_Columbia,_Canada)&oldid=155881. Giesbrecht, David. (December 2011). Clearbrook Mennonite Brethren Church (Abbotsford, British Columbia, Canada). Global Anabaptist Mennonite Encyclopedia Online. Retrieved 22 April 2019, from http://gameo.org/index.php?title=Clearbrook_Mennonite_Brethren_Church_(Abbotsford,_British_Columbia,_Canada)&oldid=155881. This page was last modified on 1 December 2017, at 05:10.